Join us on November 11th for a beautiful autumn evening of art in Georgetown’s ever expanding industrial, contemporary visual and performing artists/arts district, featuring the best of regional and national works. Be sure to hop aboard the FREE Art Ride tour to visit many studio/gallery locations, including our west, such as studio e, and Equinox Studios! Fantagraphics Bookstore & Gallery hosts Mita Mahato presenting her new graphic novel “In Between,” together with the Short Run Marathon exhibition featuring original artwork by Emil Ferris, Leela Corman, JuliaWertz, Jordan Crane, Gemma Correll, Tom Hart, nishat akhtar, Rebecca Artemisa, & Anders Nilsen. Coltura unveils and celebrates first anti-gasoline mural. The dedication ceremony of local artist, Craig Cundiff‘s, beautiful and striking mural will begin at 3:00 at 969 S. Nebraska on the S. Vale side of the building. The ceremony will feature Coltura’s founder, Matthew Metz, State Representative Zack Hudgins and lifelong south end resident and activist Paola Maranan. Come see the mural, have pizza, celebrate and view Coltura’s “gas trap!” Coltura appreciates the support of the City of Seattle through a Department of Neighborhoods grant. All City Coffee presents “Day & Night” a collection of Minimalist-Pop Surrealism with new work by artist John Tingley (tnglr). A show examining growth and change. Prairie Underground You’re invited to feast at a table of color, collage and performativtiy of Thanksgiving, November 11, 6-9pm. A new collection of pieces by FEMAIL using reconstructed Sale Samples from Prairie Underground’s archive. A series of collage inspired by the collection will be on view alongside an installation in the boutique space.Live performances throughout the evening. All items are available for purchase and three looks will be auctioned to benefit Muses Conscious Fashion Studio. Photos by Clara Pathe and Chrissie White. 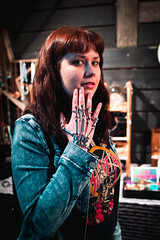 HOEDEMAKER PFEIFFER – 6113 13th Ave. S. presents Kat Larson.In Kat Larson’s latest series of photographs and video, she continues the story of a being from another planet who crash lands on Earth, which serves as a parable to the power of connection, perseverance, and strength of the spirit. Produced by Hoedemaker Pfeiffer, curated by Bridge Productions. 10 October – 31 December. Krab Jab Studios Master and Neophyte: Brigid Marlin, Brom, Miguel Tio and Kyle Abernethy. “Master and Neophyte” welcomes “master” painters Brigid Marlin and Brom, and “neophytes” Miguel Tio and Kyle Abernethy in this stunning four person show. Dark, dreamy and surreal, the paintings represent a combined lifetime of skill and vision by all four artists. Brom and Kyle Abernethy will be in attendance, hosting an Artist Talk at 7:30 pm. Show runs through January 7th, 2018. Illumination Studio# 305 presents Rostad and Ferrell. Rostad, explores the inner beauty of our neurological system through vibrant color and Ferrell explores spatial and color field through abstraction. Also welcoming Dari Stolzoff as a new partner in the studio. Music by “DJ” Luscious Leopard Lips, who brings background music with a Theremin synthesizer and keyboards. With new work up, you’ll be glad you came by. studio e WHEN YOU WERE THERE YOU KNEW THE LANGUAGE: New work by Gillian Theobald. This exhibit will include large highly chromatic abstract landscape paintings; collages made from painted found packaging (trash), manipulated into a shallow space; and some drawings of the Duwamish. Theobald typically has done more than one body of work at a time. These three series address the question of our effect on paradise. 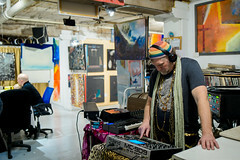 studio e is open each Friday & Saturday from 1-6pm and always during GEORGETOWN ART ATTACK! The Georgetown Liquor Co will have an encore of Dave Ryan‘s latest work (Manticore Stencil Art) for the months of November & December! Pop art on records, celebrity stencil portraits, nerdy naturescapes, and more! 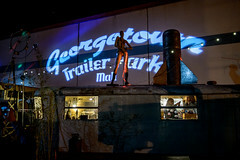 Hot Georgetown Art Attack Action on July 9! Skate down to the Georgetown Art Attack for a beautiful summer night featuring industrial strength visual and performing arts. Diverse dining, exotic shopping, adventurous galleries, festive nightclubs, music and more at over 40 locations! Jump aboard the FREE Art Ride to check out our west end locations such as Equinox Studios, studio e, and SANCA. studio e is honored to present Let’s Explode In A Climaxical Burst Of Being Here, the work of Tim Kerr. An original member of the skate punk band, the Big Boys, and currently playing with Monkeywrench, Tim has also established himself as a notable painter. Juxtapoz recently characterized his solo show at the Rosa Parks Museum as “linked to justice and knowledge.” Please join us in welcoming Tim at his first major Seattle art exhibition. Fantagraphics Bookstore & Gallery welcomes acclaimed indie comix artist Sammy Harkham and wishes a fond farewell to the Intruder at the second annual Hot Off the Press book fair! This colorful festival features tables of local handcrafted comix, prints, and zines by many of the Northwest’s most admired artists. Special guest Sammy Harkham will sign copies of the newly released Kramer’s Ergot 9 anthology as well as his alluring self-published serial Crickets. Another attraction is Seattle artist Josh Simmons signing the latest installment of Jessica Farm project, a highly conceptual comic book series designed by Harkham. After-party action at Machine House Brewery. Georgetown Records will be featuring new music by seminal Seattle punk band Chinas Comidas with a spoken word performance by the band’s charismatic singer Cynthia Genser at 7:30 PM. Bridge Productions presents new installation and video work by Seattle artist, C. Davida Ingram for her solo exhibition, “Lexical Tutor”. Miller School of Art Bring an acoustic instrument or dancing feet and play amidst the growing collection “Joy” by Heather Danso. Working in acrylic tints and mediums, her dramatically delightful portraits and playful abstracts intentionally celebrate diverse expressions of empowerment, happiness, and beauty explored through her own unique process. Krab Jab Studios presents “Im’ago Primordialis”, a rare opportunity to see fantastical realism from around the world! Also referred to as “visionary surrealism”, curator Don Farrell brings to Seattle over 20 of the best artists in this genre under one roof, including local artists Bryan K. Ward, Jeff Mihalyo, William Fahey, YvetteEndrijautzki and Don himself. All new work by Brigid Marlin, Peter Gric, Roku Sasaki, Tomasz AlenKopera, Steven Kenny, Liba W. Stambollion, Igor Grechanyk, Amanda Sage, Autumn Skye Morrison, Susannah Martin, Andrew Gonzalez, Otto Rapp, Forest Rogers, Jean Pronovost, Miguel Tio, Benjamin Vierling, and Martina Hoffmann. Additional works by Ernst Fuchs, Robert Venosa, and HR Giger. Local artists in attendance as well as Brigid, Otto, and Miguel. Opening: Saturday, July 9th, 6 – 9 pm. Runs through September 3rd. Mainframe is pleased to exhibit new works by Seattle based artist Kerrie Deck, Amy Maloof, and Seattle/NJ based artist Sophie Spies. This exhibit presents works by each artist working in textile, digital media, and found object that explore random pattern as autobiography, the new culture of observation, and storytelling. Closing reception Saturday, July 9th from 6pm – 9pm. Eight and Sand proudly presents Amanda Stalter in her solo show titled See That Silver Shine. Her work can be described as new contemporary, surreal figurative art. Amanda is somewhat newly transplanted from Los Angeles and is one of the main driving forces behind The Drawnk, a great drink and draw group here in Seattle. Georgetown Trailer Park Mall is excited to host its popular KARAOKE NIGHT for July’s Art Attack! Bring your voices and your favorite, well-practiced song choices, and we’ll handle the rest. The event goes from 6-9pm at the mall, located at 5805 Airport Way S. at the corner of Homer Street. Don’t just see the art… BE THE ART! 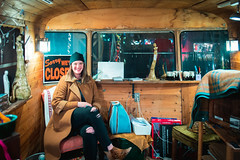 Equinox Studios is an arts community in West Georgetown, home to over 100 artists working in an inspiring array of mediums, including blacksmithing, welding, woodworking, cycle fabrication, sculpture, painting, film, glass and more. Machine House Brewery is exhibiting the works of Al Bee, a self-taught painter, tattoo artist and world traveler whose colorful gouache and ink paintings conjure surreal, dreamlike psychological universes. Machine House will also host a lively Art Attack after-party organized by the Intruder Comix collective.